Categories: Divine Names, Namadwaar Event, Prayers, Satsang, Seattle Namadwaar Event. With the blessings of His Holiness Maharanyam Sri Sri Muralidhara Swamiji, Global Organization for Divinity (G.O.D.) USA will inaugurate open its 5th US Namadwaar, at Seattle, WA on the auspicious occasion of Sri Swamiji’s Jayanthi on Nov 7, 2018 with Sri Guru Paduka Pravesham, Nama Sankirtan and an anugraha bhashanam (blessing message) from Sri Swamiji himself. G.O.D. 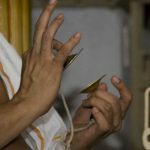 satsangs, Gopa Kuteeram youth program, and other G.O.D. 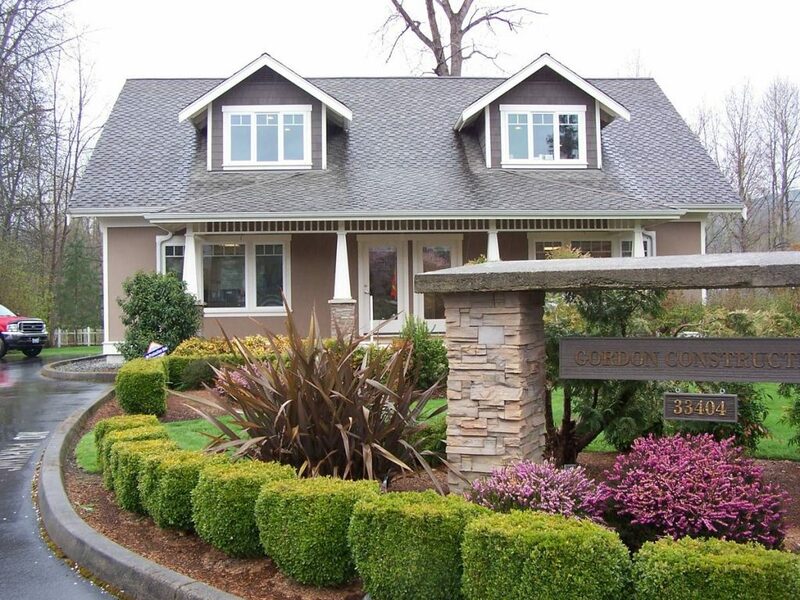 activities have been conducted actively in the Seattle area since 2008. Among several creative ventures, Seattle G.O.D. was also responsible for bringing G.O.D.’s unique Dancing Peacock Puppet Company to life, which is now active in many other cities. 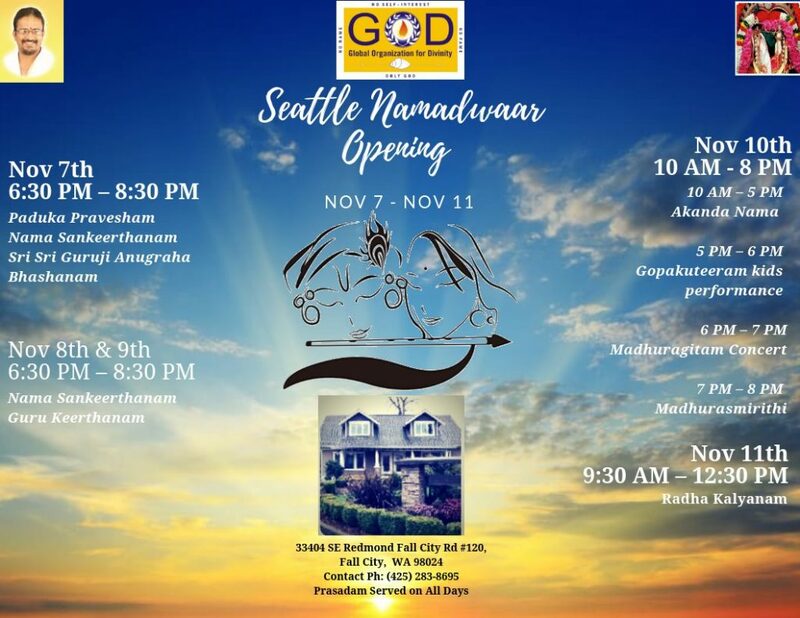 The Namadwaar in Seattle will be the fifth prayer house of its kind in the USA. The other US Namadwaars are located at Houston, Atlanta, Richmond-Virginia and Dallas. 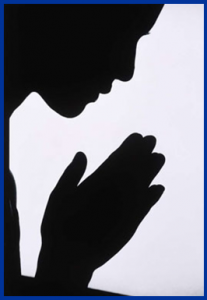 A Namadwaar is an inclusive prayer center following the pure path of love (Bhagavata Dharma) where all can feel the presence of God by the power of the Divine Name. 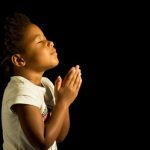 It is a direct path to awaken divinity in young hearts. The Mahamantra – Hare Rama Hare Rama Rama Rama Hare Hare, Hare Krishna Hare Krishna Krishna Krishna Hare Hare – which is the prescribed mantra for this Kali Yuga, is chanted at the Namadwaar. Prayers are performed for all prayer requests received. Satsangs and celebrations with Nama kirtanam and Katha shravanam are conducted. Srimad Bhagavata parayanam is performed. 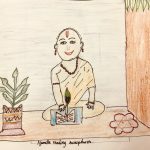 As of today (Oct 2018), there are over 45 Namadwaars around the world – 37 in India, 2 in Australia, 1 each in Singapore and Malaysia, and now 5 in the USA. Namadwaars are an integral part of Sri Swamiji’s vision to bring the simple but extremely potent Divine Name to the lives of people all around the world, to bring peace and harmony within individuals as well as Namain communities, cities and countries.